Major update: added several new entries (Portable Safe and Clock, Two Pieces of Paper, Unused Sprites, Early Sprites, Kaiji Ganto ~ Sketch), made some updates here and there, removed redundant bits, removed one entry in the Unused Graphics (3DS) section (Attorneys' Silhouettes are used in the AA3 credits). March 07 update: added another small unused dialog that I missed the first time (Unused Dialogs: Case 4, Day 1, Investigation). The aim of this feature is to list and describe all unused and cut content from GBA, NDS and 3DS versions of Phoenix Wright: Ace Attorney. Things you see here were, for the most part, discovered by me when I was fan-translating the first PW:AA for NDS and AAT for 3DS, though there are things that were first uncovered by folks at court-records.net and tcrf.net (some unused sprites, music, etc.). Unused English dialogs are from the game scripts, and since they are unused, they contain some spelling mistakes. Japanese dialogs are given for the sake of comparison. Generally, most unused content mentioned here could be found in GBA, NDS and 3DS versions. There are exceptions, thought, for instance, GBA version does not feature unused English dialogs since it was released in Japan only. 3DS re-release has some unique unused graphics, not found in any other version. Note: This article contains spoilers. Time: The beginning of the game, when Phoenix examines Mia's body and the crime scene. trying to take it out? Commentary: Although there is no safe to be found at that location in the final game, it was originally part of the background — it was situated to the right of the broken glass stand. It is not clear what part it played in the story — if any. 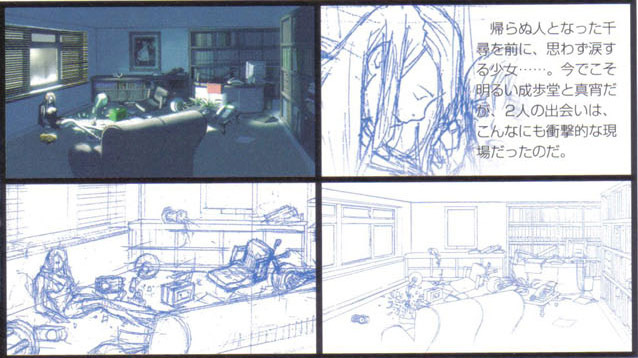 This scene also has another unused image, see the "Portable Safe and Clock" section for more information. Place: Outside Mia's office, where the player meets Gumshoe for the first time. Time: The day after Mia had been murdered. I'd better not go in. 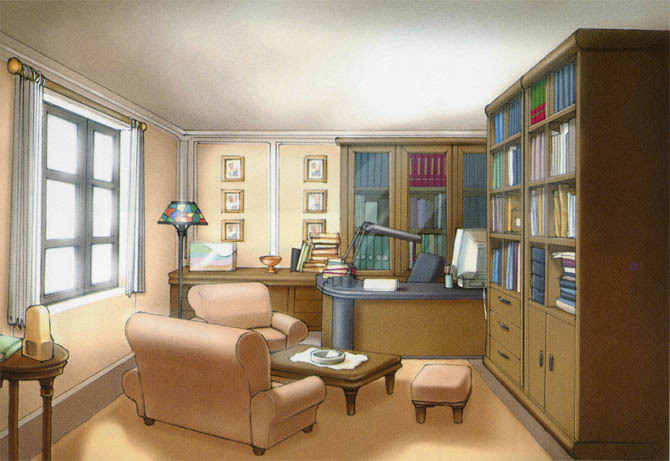 Commentary: It seems that originally, during the day when police investigated Fey & Co Law Offices, the player had access to the location outside Mia's office — the one that we see during the episode intro and where we meet Gumshoe for the first time. Judging from the text, Mia's office at that point was not accessible to the player — perhaps the whole conversation with Gumshoe occurred outside it. Place: Fey & Co Law Offices. Time: The conversation with Gumshoe, after he gives the player "Maya's Cellphone". 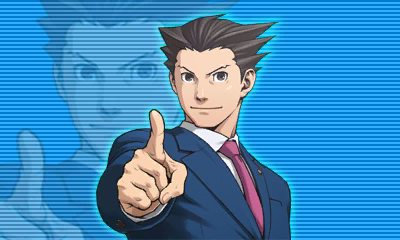 Basically, Phoenix repeats the last words he, em, "thought" after he received the cellphone. And that's it — the game switches back to the four-buttons-menu without a word from Gumshoe. Time: Before receiving Maya's Cellphone. when they brought me in. Actually, it creates a contradiction. This dialog can occur before meeting Gumshoe at the office. When the player runs across him there, his name box has "???" instead of "Gumshoe", and after this the player is asked to choose the detective's name. 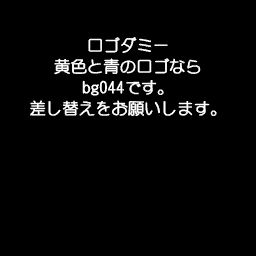 Update: this error is fixed in the Japanese NDS version. When the game was ported to the NDS the scripts were updated, but it looks like the localization team received the older scripts from the GBA version. Place: District Court, Courtroom No. 1. 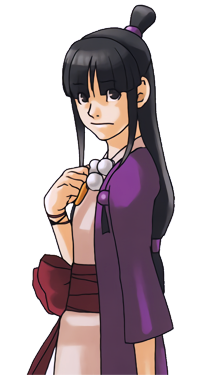 Time: When the player presses April May during her second cross-examination. Just look at the floor plan! Video that depicts the unused dialog during April May's cross examination. hold my knife in again...? 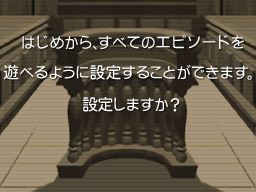 Note that in the unused dialog the fact that Mia runs to the right is pointed out by Edgeworth. Oh hoh hoh. It is simple. directly away from the door! Don't you find that odd? 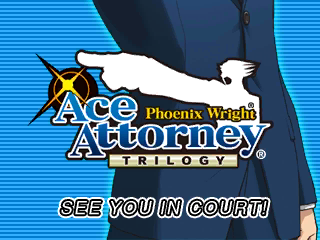 Time: When the player returns to Grossberg Law Offices after obtaining White's photo. lying there are gone now. 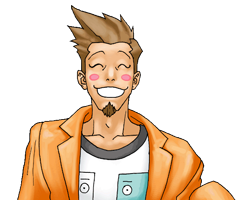 Time: When you return to Grossberg Law Offices after obtaining White's photo. lying there is gone now. noticed that one was missing? This script file is somewhat unique compared to other script files. All the unused dialogs, bar the Dialog #8, are grouped together in one section in the script. Actually, this is how dialogs from investigation parts are usually stored in game files: all text blocks related to a particular location and time are placed one after another, preceded by the time and the location name (displayed when you visit a location). And all the unused dialogs below belong to such sections. Dialogs here depict the encounter with Gumshoe quite differently — basically they were scraped and rewritten from scratch. Who knows, maybe that's why some of the dialogs that could have worked in the game were omitted altogether. Judging from all those unused dialogs, the story in this chapter (and possibly in the whole episode) would have had significant differences compared to the final game. This section also contains a regular dialog from the final game, but the game uses its copy from another section instead. Video that depicts the original encounter with Gumshoe. I have managed to restore this early encounter, you can see most of the dialogs below in this video. Note that the question "Your name" is not used in the game. For more info see the "Unused Questions" section. Place: Outside Studio One (the road with the "Welcome" sign). Time: When you talk to Gumshoe at that location. Commentary: This dialog occurred when you met Gumshoe outside Studio One, and supposedly it was a separate question (those appear when you press the "Talk" button on the bottom screen). Nick. He's not talking again. Did... I say something wrong? I guess the developers just didn't like the jokes or the way the whole exchange sounded. And, as Rubia sad in her blog, the dialog breaks the 4th wall, so maybe they cut it because of that. gave it to me, pal. crime scene before the murder. Maybe he's lying to us? a look at what you got? one with the welcome sign? snaps a photo of them! I feel an arrest coming on! The omission of this dialog is pretty strange. Either they forgot to add it back to the new script block or they didn't want to reveal who was going to be the player's opponent in that case. I do, but you can't go there. I can't go either, actually. for the trial tomorrow, see? down the path to the left? fell down over the path...? used to be, they tell me. They don't use it now, though. It seems that in the early version that road led to some place other than Studio Two. Place: Studio One Entrance (the road with the "Welcome" sign). Time: Upon examining an old signpost (in the final game it would be replaced by the Monkey mascot). And if there was no Monkey mascot it means its head didn't block the path between Studio Two and Studio One... which in turn means the whole story in this episode might have been much different than in the final game — the fact that the road is blocked affects the whole case. Time: When the player examines something behind Gumshoe. Detective Gumshoe in the way. 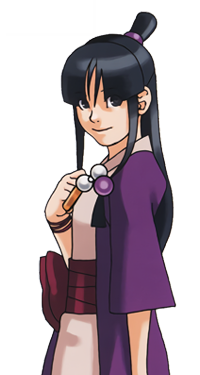 Commentary: As far as I know, in the Ace Attorney series characters cannot physically block the player from examining a location. Funny that Gumshoe indeed blocks the crime scene, albeit in Case 2 (see the "Trivia" section, although it's just an oversight... but still). Time: Upon examining an infrared sensor (replaced by a security camera in the final game). Time: After the player uses the guard station computer. from the day of the murder. Commentary: This text would kick in upon examining the computer at the studio entrance. It suggests that originally the chapter continued after the main characters had obtained some "data" — in the final game it ends right after they get the security camera photo with Steel Samurai. 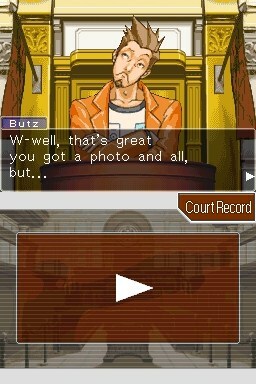 Note the word "data": most definitely, it wasn't the photo Gumshoe was talking about in Dialog #2, since the security camera is never mentioned in the deleted dialogs. Exactly what it was remains unknown. Time: When you present Gumshoe any non-relevant evidence. Place: Studio — Main Gate. Time: When the player examines the guard post after the rattle in the trailer. of me if she knew. This dialog occurred when the player examined the guard station after the main characters had heard a noise in the trailer. As you can see, the last line reflects that event, yet in the final game this dialog is not used. The most surprising thing is it was specifically added for the DS re-release, yet the English version doesn't use it. So, this is another oversight from the developers, I guess (I wonder if the Japanese version uses it. Can anyone check?). Time: When the player examines the drain with channeled Mia. My, what a rambunctious lad. It seems like a trend at this point — I mean, so many legitimate dialogs were omitted, either due to bugs or developers' oversight. Place: Gourd Lake Park entrance. Time: The first meeting with Gumshoe. 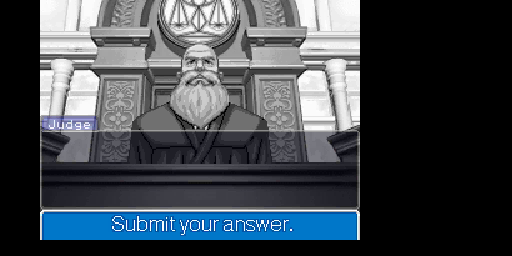 Commentary: This reply was meant to occur when the player showed Gumshoe some non-relevant evidence upon their first encounter in Case 4, but since the player has only the Attorney's badge (which has its own unique dialog) at that point in time, and Gumshoe promptly leaves afterwards, it goes unused. It must be noted that the player does meet Gumshoe later in the game, but instead of this reply we get a completely new one. Time: When the player presented the "Safe" evidence which was later cut to the Old Man. Commentary: Originally the Old Man's safe was an obtainable evidence, and this conversation occurred when the player showed it to him. The "Safe" evidence is mentioned in the "Unused Evidence" section. Place: District Court, Courtroom No. 3. 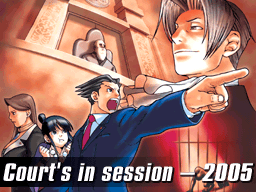 Time: When the player objects to Larry's statement during his first cross-examination. but I didn't notice the boat. 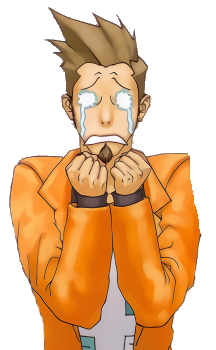 Video that depicts the unused dialog during Larry Butz's cross examination. a boat on the lake? Look at this picture, Larry! lake when the gun fired! out over the lake, okay? Three dialogs in this section are early versions of the regular dialogs that appear in the game, but it is only true for the English script — in the Japanese script there are no differences between them. By looking at the English dialogs it becomes clear that they are not an early translation attempt — there are some crucial differences between the unused and regular dialogs. I guess, the Japanese script file was changed after it had been sent to the translation team. Because of it I won't post the Japanese version of those dialogs. Time: When the player sprays Marshall's locker with luminol. Where do they sell that?? I want to buy some, too! the Chief and buy some now! So, where do they sell it? if he fled out the door. stuff you got there, pal! I'd like to get some too! Where do you get this, Ema? I always buy it by mail order. 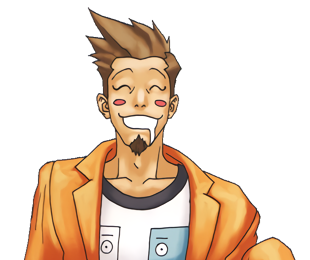 Time: When the player sprays Gumshoe's locker with luminol. you to do me a favor, okay? (This is a major clue! You can't trust those police! You'll testify for me, right? (This is an important clue! I'm counting on you guys! What? But you're a detective! 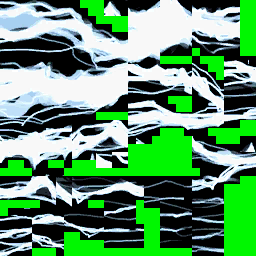 Time: When the player sprays the area near the broken vase shards. Time: When the player examines a piece of paper found inside Gant's table. Why are you sweating, Mr.
Huh? Oh. No, it's nothing. Note that in the unused dialog Gumshoe had a line, while in the final version he was replaced by Ema, but the line itself remained the same. Just a small note: there are two types of 3D Evidence dialogs: the first one engages when Phoenix is with Ema and the other when he is alone. Both types of dialogs occur when the player examines any evidence in 3D mode in Case 5. Since the player can do this anywhere and at any time during Case 5, there is no need to mention the place and, well, the time. Commentary: This dialog was meant to occur when the player examined Gumshoe's ID card without Ema. In the final game the player has his card for a short period of time, and since Ema never leaves Phoenix while he has the card, it is not possible to activate this dialog. This tape has a label on it. the time it was recorded. 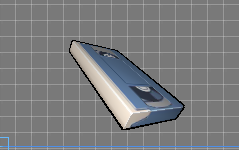 Commentary: Originally the player could examine the tape with the security footage of the Evidence Room in 3D — it's model and texture can be found in the game files (see the "Unused 3D Models" section). In the final game the developers either forgot to activate it or intentionally disabled it. Commentary: This description of the tape occurred when Ema was not with Phoenix. 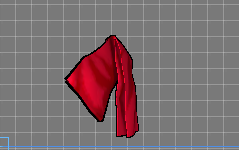 Commentary: This dialog occurred when the player examined Lana's muffler (scarf) in 3D, which was later removed from the game (see the "Unused 3D Models" section). The icon of the safe was left in the game. The game script contains an unused dialog related to this evidence (see the "Unused Dialogs: Case 4, Day 2, Investigation" section). Note: In the DS version all evidence have two captions: for the upper and bottom screens respectively. The English "Contradiction Award" title is only found among the upper screen captions. Commentary: Most likely it is the original name of the "King of Prosecutors" trophy. In the Japanese version it is called "Kenji of the Year" (kenji — prosecutor). 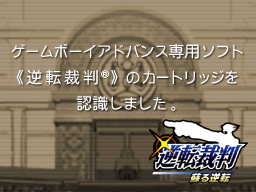 In the English version they localized it as "King of Prosecutors" in order to explain the "K" letter on the trophy. Later in the story Edgeworth explains why the trophy consists of a shield and a halberd (actually it is a spear, don't know why they mistranslated it as halberd). It is revealed that it symbolizes a "contradiction". A fitting name for this trophy. Note: The description graphics is already misaligned, it is not due to incorrect extraction. Commentary: It seems this evidence was originally used in place of "Goodman's Lost Item Report". Apparently it was also viewable by the player. 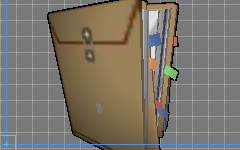 Note: screenshots of the unused 3D models were taken from Ace Attorney Trilogy (3DS), while textures were extracted from the DS version. 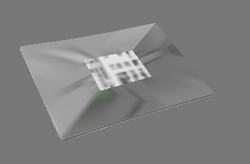 The 3DS re-release uses 3D models and textures taken directly from the DS version. And while the 3D models faired fine, due to the image format used by the Trilogy re-release, the textures became ridden with horrible compression artifacts. 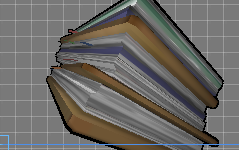 This is why the textures below are from the DS version. 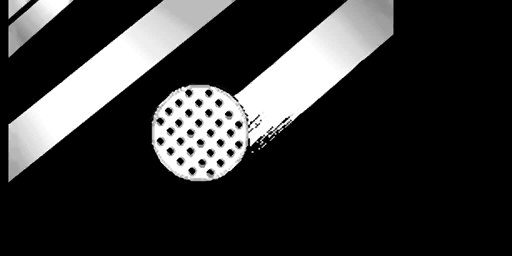 Note: for some reason the DS version contains two instances of the muffler texture. 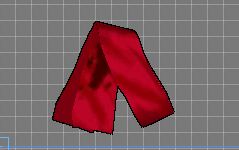 Note 2: this evidence has no caption graphics, but in the game it is referred to as Lana's muffler or simply muffler/scarf. 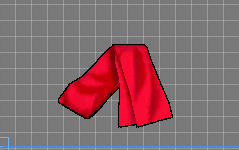 Commentary: The game contains an unused 3D model of Lana's muffler. 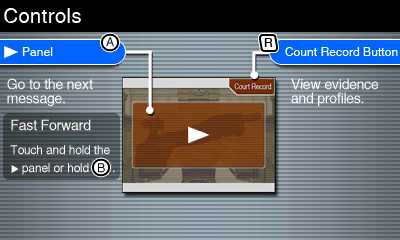 It has three additional images: two icons for the top and bottom screens (they are the same) and a thumb image for the Court Record menu — only the top screen icon is used in the final game. ...but the thumb image is not. The thumb icon suggests that Lana's muffler was once an actual evidence, because otherwise there was no need for it. It also has a corresponding dialog (see the "Unused Dialogs during 3D Evidence examination" section). The muffler has a bloody spot on its inner side that probably activated the above mentioned dialog. 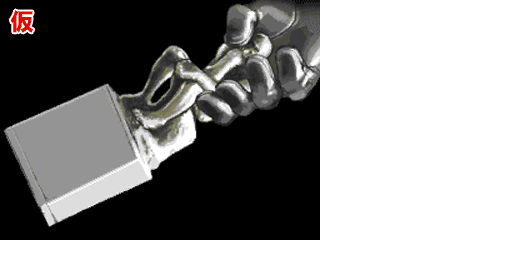 I guess, the player received this evidence alongside the "Switchblade Knife" brought by Gant, and since it served no purpose further in the story the developers decided to cut it. 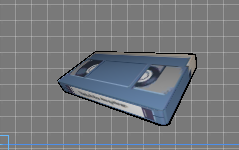 Commentary: Originally it was possible to examine the tape with the security camera footage in 3D mode. It had two related dialogs (see here and here). In the final game it is only possible to view the corresponding video. The top side contains some sort of package. 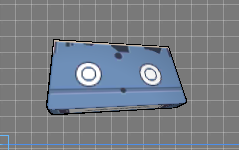 Note: the following 3D objects are from two separate files, but they are part of the main 3D model since they all share the same set of textures. Paper 1, top. Was presumably inside the topmost package. Paper 1, bottom. The aforementioned package. Paper 2, bottom. It is hard to tell where it was situated. 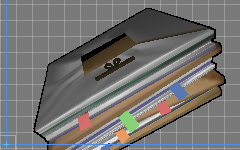 As you can see, the icon depicts a stack of documents with Paper 1 on top of it, while the 3D model has some sort of package at the top. 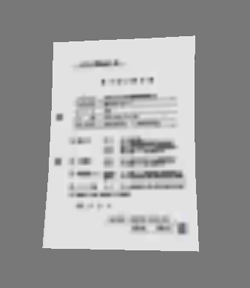 The screenshot above shows that Paper 1 is actually part of the package. 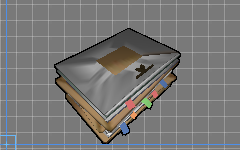 It's quite possible that Paper 1 in the icon covers the package seen in the 3D model. Maybe the player had to examine the package to reveal Paper 1 below it? There is also Paper 2, but it is not clear were it was placed in the stack of documents and whether it was used at all — it could just be a prop object. Questions appear on the bottom screen when you talk to characters during investigations. Note: graphics of the same type are usually grouped together. Questions and Answers graphics are for the most part sorted based on their appearance in the game, but there are exceptions to this rule. This is the only unused question. There are two instances of it in the game resources — the first one appears at the beginning of the Questions graphics section, right before the "What happened" and "You and the chief" questions. They appear during the first encounter with Maya, and that means that originally the player could ask Maya three questions, instead of two. Looks like it was removed to streamline the game: in the end she mentions her name right before the player is able to talk to her. Its second instance can be found between the "The director, at al." and "The producer" questions from Case 3. Some of the preceding questions are from the conversation with Penny Nicols and the following questions appear when you meet Sal Manella. "Your Name" could fit both events, but most likely, it is the remnant of the early version of the encounter with Gumshoe (see the "Unused Dialogs: Case 3, Day 1, Investigation" section): one of the dialogs begins with the words "Um, Detective? What was your name again? Bobby, was it?". Answers mostly appear on the bottom screen during court proceedings and affect the course of actions. Has no corresponding Japanese graphics (can't say for sure since there are more then 300 files in the Japanese section and I haven't checked them all — I am simply not that good at Japanese). It seems they were used during Mike Meekins' cross examination. 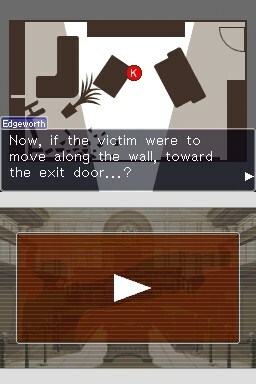 I guess those answers appeared around the time when Edgeworth asked Wright whether there was something wrong with the security video. "Prove with evidence" could have been a red herring. Those hints appear at the top screen during certain events, for example when you have to choose between two or three answers ("Choose your answer"). Note: The GBA release features all the unused content from the DS version. The images below are only found in the GBA version. "Court's in session [this] October! Enjoy!" The lefover title and end game images from the demo version. Court's in session — 2005. The DS version also contains the ending screen from the demo version, albeit in English. Note Maya's mouth, which is closed now — this is how she appears on the actual artwork. The GBA version of Gyakuten Saiban has been detected in the cartridge slot. Would you like to open all episodes before starting the game? The Japanese version allows to unlock all cases if the GBA version of Gyakuten Saiban is present in the GBA cartridge slot. Since the DS version is the first release of the game outside Japan this feature was removed, but the corresponding images were not. A dummy image for an age box (they are used for evidence descriptions in the Japanese version). Japanese bubbles from the GBA version. 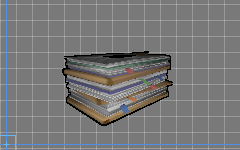 Stored as a single image rather then tiled sprites. It lacks any palette, so I had to use the GBA bubbles palette. This image also appears in the 3DS version. GBA button icons and GBA UI "Press" and "Present" buttons. Those images are from the 3DS version — they are in the DS version too, I just cannot find them. Those buttons are used only in the Japanese version: they allow you to switch the language of the game just like in Ace Attorney Trilogy for 3DS. 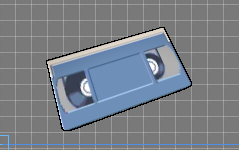 Some unknown tape icon. Similar image also appears in the 3DS version. Dummy icons from Case 5 (see the "Trivia" section). 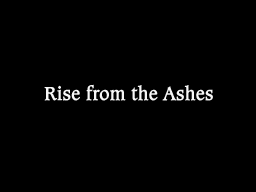 An empty black image that only contains the Case 5 title, "Rise from the Ashes", at the center. Strangely, there is no Japanese version of this image. Note: The following images do not appear in the DS version. Note 2: Many regular images/sprites have multiple duplicates — they are not mentioned here since they look the same and are basically garbage files. 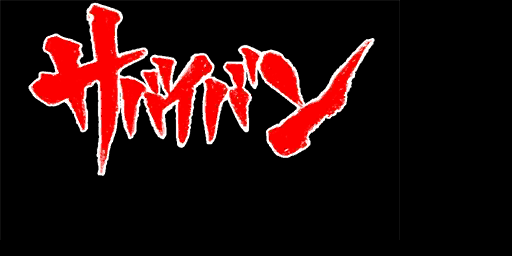 The leftover demo version logo (it's almost a tradition now). The image shown after the completion of the demo version. Another image from the demo version that explains the bottom screen controls. 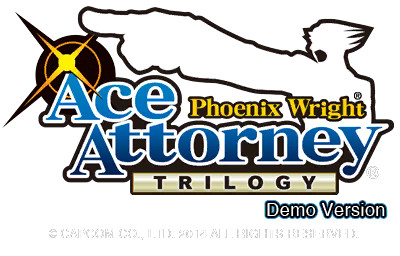 The notice screen from the demo version. 敗訴!! ([You] lost the case!). Internal file name: haiso. Phoenix is sitting under a spotlight, with his back to the viewer, embracing his knees. Note the low resolution nature of the image. This picture is directly related to the next one. サバイバン (Sabaiban). Internal file name: haiso2. Sabaiban (or Surviban) was the original title of the game — it is a portmanteau of "Survival" and "Saiban" (trial). This could be the original logo from that time, though there is no reason whatsoever for it to appear in the 3DS re-release. This image certainly does not appear in the DS and GBA versions. Maybe it's some kind of in-house joke? 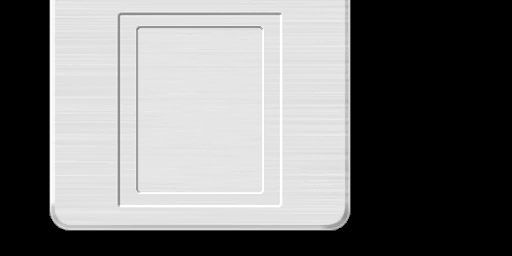 The first image has already been mentioned in the "Unused Dialogs: Case 2, Day 1, Investigation" section — it is an unused image of a portable safe that was present at the crime scene in Mia's office. It is not clear what part it played in the story — if any. The second item appears to be a clock. As you may know, the "Turnabout Sisters" episode was supposed to be the first case, and this clock was the original murder weapon (in the final game Mia was killed with The Thinker statue introduced in the first episode, "The First Turnabout"). The clock appeared at the same spot as The Thinker statue in the final game, while the safe was situated to the right of the broken glass stand. Surprisingly, the lower left image, which is the early draft of that location, features some unknown object to the left of the stand. The item on the table on the left is actually the aforementioned clock — the table even appears on the early draft image. And the object near the light stand is probably that rectangular thing featured on the early draft — an aquarium perhaps? In the final game Mia's body and the broken stand are part of the background, while these two images suggest that at one point in the game they were meant to be removed — the bottom right drawing above also lacks Mia's body. 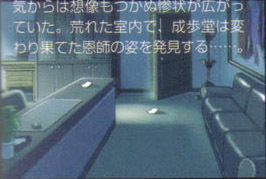 All this means that the night office location was intended to be visited by the player again — but under different circumstances. For some reason the portable safe and the clock images appear only in the 3DS version. Piece of paper from the counter. Piece of paper from the floor. This looks like an early version of the Parking Lot Floor Plans from Case 5. Lower part of the safe from Case 5, but without a keypad. The unused frame from the animated Ace Attorney 2 Case 2 intro (car headlights flash). In the final version you can quit a game only after making a save — at that point you see the image with the word "Save" like in the DS version. In the mobile ports though the player can choose between saving and going to the main menu or saving the game without quitting. I guess this feature was planned to appear in the 3DS port, but in the end it was cut for whatever reason. Unused English font table from .bch file. In the final game all fonts are stored in the BCFNT format. This placeholder is based on the image from the DS version of the game. This placeholder is basically a screenshot from the DS version. For some reason the hint features bigger font and blue background. It was probably used for test purposes. 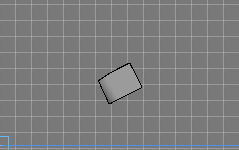 Another placeholder, this time featuring the gavel animation frame. What is interesting about it is that it has motion blur — this effect is used in the GBA versions but not present in the DS re-releases and 3DS Trilogy. "Dummy Logo. The yellow and blue logo is bg044. Replace it, please." The save data is corrupted and must be daleted (sic). 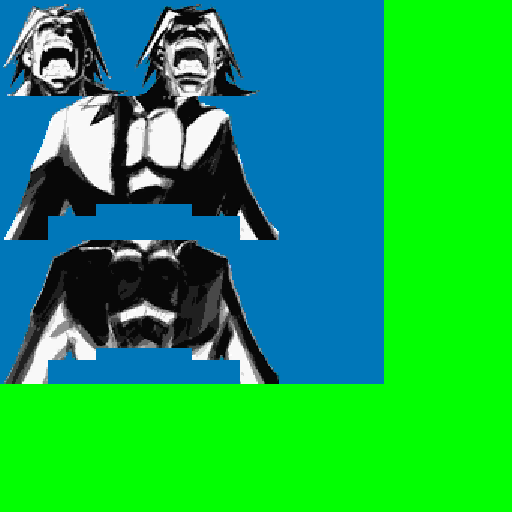 There are three instances of this image — the third one does not have this mistake and it is the one actually used in the game. First he moves from side to side, as usual, but suddenly he stops and becomes serious. The animation is actually composed of two sequences, and you can clearly see where the second one starts — where the bottom part cuts off. It also points to the fact that this animation was meant to be used only during court proceedings. 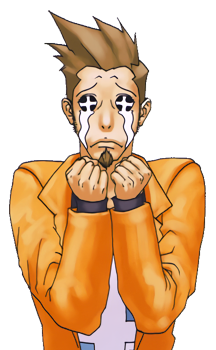 The same goes for Edgeworth's and Butz's unused animations — they both lack the bottom part, because it would be covered by the witness stand. 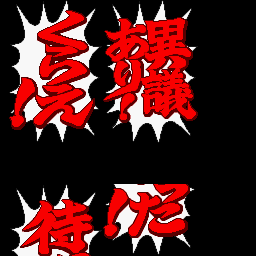 In Gyakuten Saiban Jiten encyclopedia it is listed as ダメージ(ゲーム未使用) (Damage (unused)). This animation is similar to the one used in the game, save for one thing: in the unused animation Jake eventually bites the piece of dried meat off. 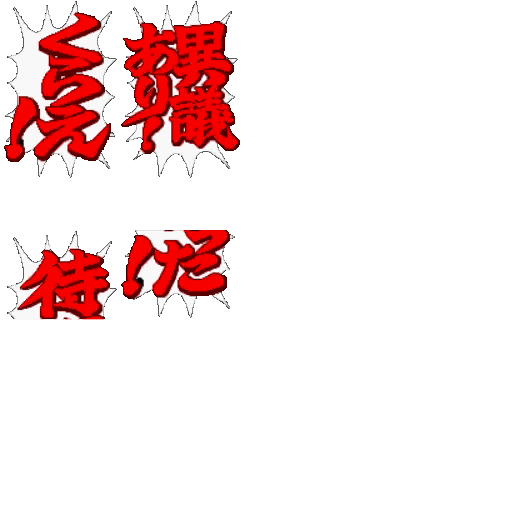 In Gyakuten Saiban Jiten it is listed as 噛み切る(ゲーム未使用) (Biting off (unused)). He just stares and moves his head in a funny way while standing still. 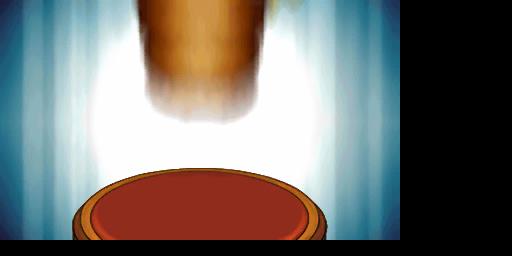 For some reason this animation has no separate entry in Gyakuten Saiban Jiten. Instead it is the idle part of another animation called 敬礼 (salutation). And while the salutation part features prominently in the game, the idle part is not used at all. 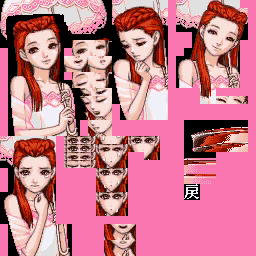 I thought that maybe it was used in Ace Attorney 4, but judging from the sprite sheet it is not even present in that game. Phoenix Wright has throbbing hearts in place of his eyes. Originally his first meeting with April May happened during the trial, but at some point in the development their encounter was moved to the investigation day, and thus this animation lost its original purpose. In Gyakuten Saiban Jiten it is listed as ハート(ゲーム未使用) (Hearts (unused)). 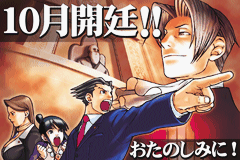 This is basically the same Edgeworth damage animation but from a full face angle. 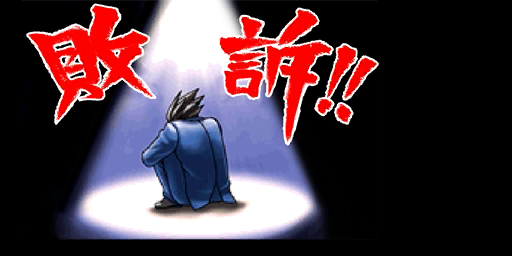 The sprite lacks the bottom part which means that it was used when Edgeworth took the witness stand at the end of Case 4. I guess it wasn't used because his cross-examination doesn't take that much time in the game. In Gyakuten Saiban Jiten it is listed as ダメージ(ゲーム未使用) (Damage (unused)). Larry moves his jaw up and down in quick successions. This is his reaction upon being caught lying. 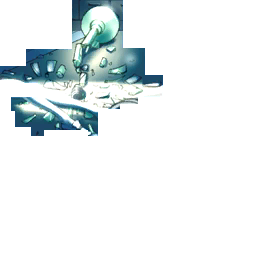 This sprite could only be found in the Art of Gyakuten Saiban (where it's listed as 困惑 — bewildered), and not in the game itself. It was likely omitted due to its redundancy, since there were already sprites that conveyed similar emotion. 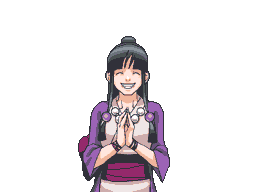 Similar to the previous one, this sprite is found only in the Art of Gyakuten Saiban under the name うなずき — nodding. As the name states, it was part of her "bowing" animation. 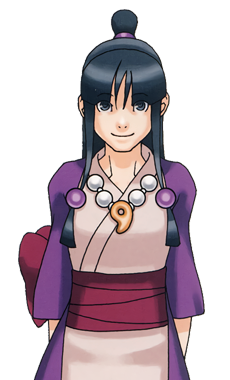 It looks similar to the sprite from the final game, except here Maya's mouth has more prominent corners and her teeth are clenched together. This sprite is also not included in the game. It could be found in Gyakuten Saiban 3 Fanbook. 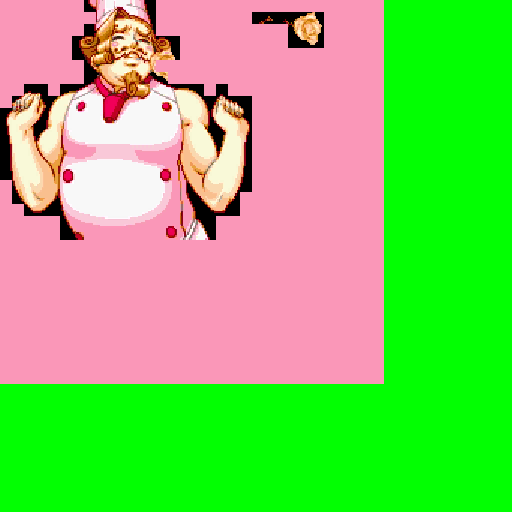 It was supposed to be part of his "bowing" animation, and the final game even has an additional repeated frame that probably contained this sprite. Most likely it was removed because the switch between this and the previous/next frame was somewhat abrupt, or because the developers just lacked a free space on the cartridge. First of all, it should be stated that the following images are definitely not character artworks — they were clearly intended to be used in the game. Their poses and general similarities to the sprites featured in the game further prove this point. When doing a comparison keep in mind that the color hues do not match the way they originally appeared, due to the fact that those stills were obtained from imperfect paper scans. The images bellow do not appear in the game files in any way. The way it appears in the final game. The early version, while having the same pose, had some major differences. The Art of Gyakuten Saiban lists it under the title フキゲン (Sullen). Despite appearing the same on the first glance, it actually looks quite different to the final sprite. The fringe has more splits in it, the shape of the face is slightly elongated, the shoulders are less rounded, the beads on the necklace are a tad bigger, while the beads on the braids appear smaller, the bandage is wrapped in the opposite way, the robe side goes way bellow the bandage, the bow is smaller, but wider, and it also appears in front of the arm — not behind it. 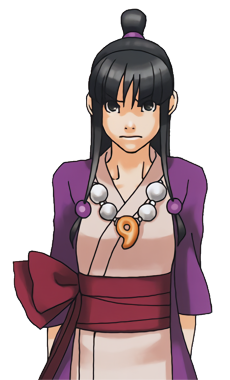 Also you probably noticed that in this early sprite Maya is not smiling, but looks rather sad — in the final game she does not have this emotion when she stands in this pose. 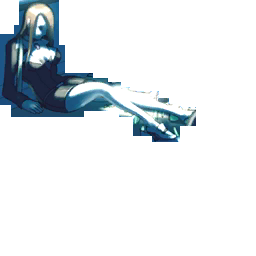 This sprite also appears in The Art of Gyakuten Saiban, under the title 真剣 (Serious). As you can see, it has the same changes as the previous sprite, but also reveals that Maya's sleeves are longer and more narrow. I think it's safe to say that the reason behind those changes is the artistic choices and color limitations of the GameBoy Advance. ...but this one looks quite differently. The way it looked originally. An unknown track which might have been the original Case 4 ending theme. This was supposedly Damon Gant's main theme, but it was ultimately replaced with the more pompous "Kaiji Ganto ~ Swimming, Anyone?" tune. This track is not present in the game resources in any form — it first appeared in the Gyakuten Saiban Yomigaeru Gyakuten — Yomigaeru Remix album under the title "Kaiji Ganto ~ Sketch (Unused Tune)". Here I will describe some small but interesting tidbits that do not belong elsewhere. In the English version recollection scenes in the first four cases lack the usual black-and-white filter, but it is present in the Japanese version of the game. Strangely enough, the English version does feature the black-and-white filter in case 5. Even though the Japanese version has the black-and-white filter, it is not used during every recollection scene. During the conversation the background changes to the office with Mia's dead body. 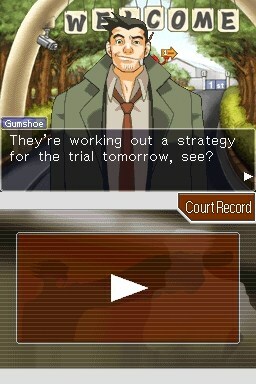 At the same time Gumshoe is present on screen and continues the conversation. It's actually an oversight: this is a reminiscence scene and Gumshoe is not supposed to be there (his sprite covers the glass stand, rendering the whole scene pointless). The US version contains the Japanese version of the game with the exception of the Japanese scripts which are replaced with dummy files (although AA2 and AA3 do contain them). It's not surprising since the Japanese version includes the English localization, which you can activate through the main menu (just like in Ace Attorney Trilogy (3DS)). The sound of the gun shot in Case 4 intro is actually a reused sound of Berretta M92 from Resident Evil (PS1). 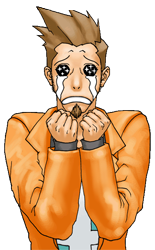 At the end of the last investigation day in Case 5, after Gant spots Phoenix, Ema and Gumshoe in his office, the game automatically moves you to the Detention Center and blocks you from leaving it. Judging from control codes in the script, originally the player weren't forced into that location — instead they could explore all the available places. The developers probably did it to avoid unnecessary wandering. 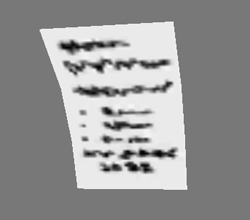 There is Maya's profile in Case 1 files — a remnant from the time when Case 2 was the first episode in the game. There's also Mia's profile in Case 5 files — maybe originally she had a more prominent role in this case? 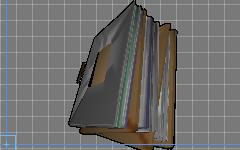 Case 5 has at least five unused evidence slots. There is a way to activate them — they contain dummy icons, but reuse the description from Mia's profile.